A small dog riding an escalator with his owner at Los Angeles International Airport last week could have lost a paw if not for the quick actions of a good Samaritan and police officers nearby. The dog’s paw got caught in the grate at the top of the escalator. A passerby who witnessed what happened quickly pressed the emergency shut-off button to stop the escalator. LAX police officers were able to unscrew the grate’s teeth and free the dog’s paw. Fortunately, the dog did not appear to be seriously injured. The entire scary incident was captured by security camera and posted on TMZ. A year ago, the exact same thing happened to another small dog riding the escalator at the Fort Lauderdale-Hollywood International Airport. That dog was also safely freed, but bit his owners in the process. Lesson learned: It’s not a good idea to let dogs, especially small ones, ride on escalators. Unless you can can carry your dog, always take the stairs or elevator instead. “Many pet owners do not understand the danger escalators and moving walkways pose to pets, who do not know that they need to lift their feet at the top to avoid being trapped by the ‘combs,’” MSPCA-Angell warned in 2012, after a Pomeranian mix named Mace lost two toes after getting his paw stuck on an escalator in a Boston subway station. 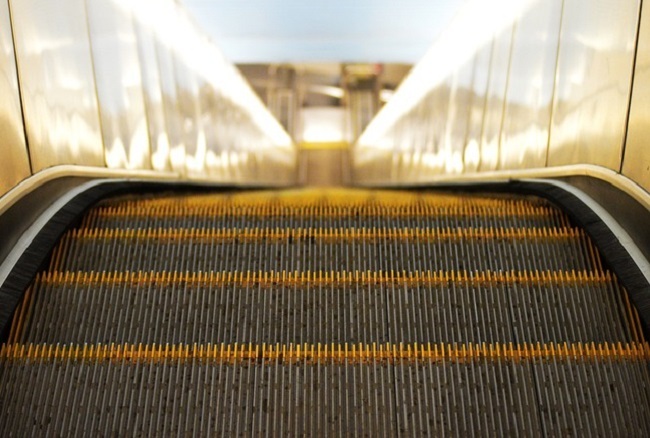 Each year, MSPCA-Angell veterinarians perform surgery on an average of two to three dogs whose paws were mangled after they were stuck in escalator combs. If you can’t carry your dog and must ride an escalator, bring booties for him to wear, suggested Jeannine Berger, DVM. “Just make sure they fit snugly, without superfluous material that can catch in the moving escalator parts,” she warned.